Maya's Granny: Who To Vote For? I haven't said much about politics lately. It is too depressing. For decades I was a Libertarian. The platform of maximum social and economic liberty seemed sensible and sane and in line with the Constitution. Over time, as I saw regulations relaxed and learned that not all corporations are run by saints, I came to realize that pure libertarianism is like pure communism: it sounds real good and if only people acted in real life as they do in theory it would work for the good of all. But, we have learned painfully that communism doesn't work in a pure form; even if it doesn't get involved with a dictatorship, people don't put maximum effort in for minimum reward. There has to be something in it for me or I won't do my best. And the same is true for the libertarian dream. There aren't enough leaders of industry who will self-regulate when it hurts their bottom line. Instead of the ideal of the corporation that wants superior workers and so pays above union scale to get them, we have the many corporations that off-shore their labor so that they can pay slave wages to people working under slave conditions. As much as I would like to believe that corporations are as good as three year olds and will live up to expectations when treated with respect, it just ain't so. People need rules, and people with power don't like to obey rules. Don't think the rules apply to them. Nonetheless, I used to vote Libertarian anyway. There wasn't a chance we would win anything big, but we might influence the winners if we got enough votes, and since I believed that influence would be in the direction of freedom, that would be good. And things got worse. And in 2006, the electorate reared up on its hind legs and voted the Democrats into majorities in both house of Congress. Perhaps not big enough majorities, but nonetheless, majorities. And what good has it done us? Does the Democratic led Congress vote the way the electorate wants them to? It seems to me that instead of taking their cue from their election and the increasingly low approval ratings of Bush and his policies, of the fact that ever larger numbers of people think the country is going in the wrong direction, they vote for whatever George Bush wants. They renewed FISA for six months, with a promise to revisit it then and correct its most egregious parts. And then they allowed themselves to pass it again, with the added provision that telecommunication companies that went along with the administrations requests for warrantless wiretaps on US citizens be immune from prosecution. Until Senator Chris Dodd put a hold on the Senate FISA bill, which, I understand, will prevent its passage. At last. Someone with guts. Dodd joins Kucinich, in the House, whose introduction of Articles of Impeachment against Cheney also takes a stand in action against the erosion of the Constitution. So, now I have two men to choose between. 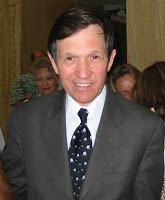 It will probably be Kucinich, again, because I agree so closely with everything he says. But, I could give my vote to Dodd if he made the ticket without much concern. A candidate with guts. I think they need a good strong dose. *Ah, perfect record -- I've never yet voted for anyone who actually won an election. Grrr. Stupid blogger ate my comment. I wonder how many of the Dems in Congress have a conscience, and know that they are lily livered spineless toads, but are afraid to stand up to the smear machine that is the executive branch? We've seen how nasty they can be, and sadly, how effective it seems to be. I sometimes think that until the public stops being swayed by lies and cries of 'traitor', Congress will be afraid to grow a spine. A talk show host on KGO put it best when a caller said "Well, if the Dems don't side with the Republicans, they will be painted as "soft" when it comes to terrorism." The host said: Who gives a fig about the Republicans think! (Note: he did say "fig.") Why is it so important for Democrats to act in such a way that Republicans are satisfied with the outcome? It doesn't matter what Democrats do, the Republicans are going to find a way to smear them, so just do the right thing and act how the people who voted for you want you to act!" I don't think the Democrats are afraid of being slimed by the Republicans. I just think they are afraid that if they do the right thing by their constituents, they will experience a sudden DE-flation of their wallets. 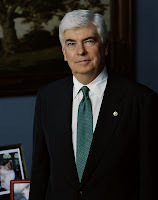 I saw Chris Dodd on The View the other day, and really liked him. I'm still registered Libertarian simply because I believe as many parties as possible should have a chance to be on the ballot. I'm so damned sick of our "two party" system. And I really can't stand either main party. I vote for whoever is coming the closest to having some sense of caring about what's good for the country rather than their party or their own personal interests. It seemed to work. Until 2000. I voted for Gore of course. But after that "election", and the Supreme Court atrocity that followed, I will NEVER ever vote for a Republican, and hope the party dies eventually. The corruption of these people still astounds me. I became very politically involved, and follow all elections closely now. While I have little hope the Dems will grow a spine as a party, there are individuals I admire and support within the party. Let's hope we can regain control of our country in the next few years and get rid of these neocon clowns.